The holidays are an exuberant time of year. It is a high-spirited season full of euphoric joy, cheer, and lighthearted jubilance. We are alive with energy, and we appreciate spending time with the many people for whom we care so dearly. But it is also the season of gift giving—and finding the best gift, especially for those who are adopting a new, healthier lifestyle, can be difficult. Although holiday gifts aren’t the reason we celebrate the holidays, they are a fun addition to accompany the excitement. It’s always best to get a thoughtful gift, so considering someone’s lifestyle should be a factor when it comes to gift giving. So what do you give the person who is interested in improving their health and wellness? Chocolate and candy canes probably aren’t on their list; anything that leads to better health probably is, though. When I was young, I was always excited to open my presents. Oh, who am I kidding…I’m still excited. But what’s also exciting for me is finding that perfect gift for better health. So here are a few items that anyone looking to improve their health and wellness would definitely appreciate. Jewelry is a common gift around the holidays. Diamonds and personalized necklaces are commonly given for that special someone. But what about jewelry that actually benefits your health? In the digital world, your health can be at risk by wireless and electronic devices that emit electromagnetic field (EMF) frequencies. These frequencies can negatively affect the immune system by disrupting the natural function of the cells in your body. A possible gift to protect the health of your loved one from EMF exposure may be the Lotus Shield, which is worn on a necklace. The Lotus Shield protects you from the harmful effects from EMF and radiation exposure. It contains copper and zinc, which help raise the energy of your body’s cells. They come in silver, 14-karat yellow gold, and 14-karat white gold. Does your loved one rely on their smartphone to wake them up in them in the morning? Well, because of the powerful EMF exposure from phones, it’s best to keep all electronic devices out of the bedroom. A thoughtful gift may be a simple analog alarm clock, which will help your loved ones get a better, more restful sleep better. The holiday and winter season can definitely be a hectic time of year. Essential oils and diffusers are perfect holiday gifts. There are many essential oils that can benefit anyone with any health condition. For that person who seems to be sick all the time, Thieves is a blend that can support the immune system. Essential oil companies also have remedies that can relieve stress and help promote relaxation, such as lavender, sandalwood, spruce, or copaiba. Mala beads are another great gift idea in the jewelry realm of health. At a recent holiday party at the yoga studio where I practice, we had the opportunity to create personalized mala bead necklaces. Malas are considered a great aid for meditation. Mala necklaces or bracelets contain 108 mala beads, as well as marker and guru beads with stones and crystals that symbolize grounding and comforting qualities for your practice. Mala beads are welcomed companions for yoga practitioners on your holiday list. Books are a perfect tool to empower your health and wellness. Education and trying new things is the best recipe for good health. My bookshelf is packed full of books that help with my nutrition and wellness education. Look for a good introduction book to holistic eating, naturopathic medicine, or raw food healing diets. These types of books are great for anyone looking to making a healthy switch in their diet to better their overall health or treat a health condition. I believe cooking your food makes all the difference for your health. The issue is that many well-intentioned healthy people don’t know how to cook, so they may find themselves ordering in and letting someone else do the cooking instead. Learning to create healthy meals is part of the transition to a healthy lifestyle. It helps to have high-end appliances; however, good-quality machines do the job as well. Good blenders and food processors can typically be found for less than $100.00. You could maybe even throw in a healthy recipe book to help get them started on their healthy eating journey. Yoga gear, such as mats, water bottles, or blocks, and yoga classes or gym memberships also make great gifts. Herbal teas, such as chamomile or lavender, also make great stocking stuffers; they can also help you get some sleep during the holiday season. A tea tumbler is also a good way to travel with your healthy teas. Food and health documentaries can also be a great idea for that health enthusiast on your list. 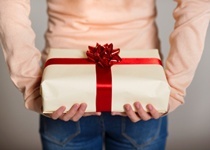 I hope these holiday gift ideas improve someone’s health that you know and help you shorten your list of gifts to buy. From everyone at the DoctorsHealthPress team, we wish you an amazing holiday season, full of health and happiness! “Lotus Shield – 14K Gold,” Eradicator web site; http://store.eradicatortechnologies.com/index.php?route=product/product&product_id=54, last accessed December 8, 2014. Medalye, J., “How to Use Mala Beads for Yoga and Meditation,” Gaiam TV web site, February 16, 2013; http://www.gaiamtv.com/article/how-use-mala-beads-yoga-and-meditation, last accessed December 8, 2014.